A while ago we shared the story of F.D.C. Willard, an ordinary housecat who through a confluence of mistakes and errors, ended up being listed as the co-author of a widely cited science paper on low temperature physics. Today we’re telling a similar story about an equally impressive Tabby called Larry who is, believe it or not, an official employee of the UK government- appointed by none other than British Prime Minister, David Cameron. Officially Larry’s full title is “Chief Mouser to the Cabinet Office of the United Kingdom of Great Britain and Northern Ireland” and his duties mainly involve keeping the famed residence of the Prime Minister – 10 Downing Street – free of pests such as mice and rats. Larry is one of only a handful of cats in British history to officially assume the role of Chief Mouser, though there have been many other cats that have served essentially the same role over the years who did so without the need for a fancy title or taxpayer money. The role of mouser supposedly dates back to the reign of King Henry the 8th in the 16th century, more specifically his appointing of Thomas Wolsey as Lord Chancellor in 1515. Wolsey was a noted cat lover and is said to have had one at his side pretty much all of the time to such an extent that a recently erected statue of him features a small cat. As such, it’s believed one of Wolsey’s many cats likely served as the first mouser for the government, official or otherwise. But as for the titled position, the records only go back as far as 1929 when it was noted that the Treasury authorised a set sum of money for “the maintenance of an efficient cat”. 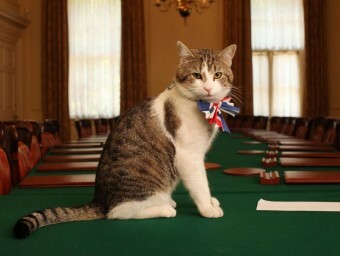 And if you’re wondering, it’s typical for such a cat to serve at Number 10 under multiple prime ministers. For instance, one Peter III served as Chief Mouser from 1946-1964 under Prime Ministers Clement Attlee, Winston Churchill, Anthony Eden, Harold Macmillan, and Alec Douglas-Home. Moving back to Larry, when David Cameron assumed office in 2010, 10 Downing Street didn’t actually have a Chief Mouser as the previous Mouser, Sybil, had been retired in 2009 supposedly because then Prime Minister, Gordon Brown, didn’t like her. Initially, David Cameron resisted the idea of hiring a replacement Chief Mouser, until rats were noticed scurrying around outside of 10 Downing Street in several live news reports in early 2011. 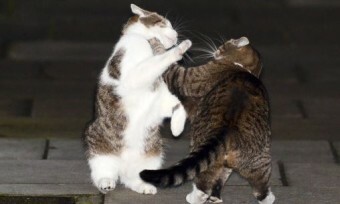 Though Cameron denied that any plans were in place to appoint a Chief Mouser, internal sources revealed that there was a strong and ever present “pro cat faction” in 10 Downing Street. Apparently this mysterious faction were able to sway the Prime Minister because, despite his reservations, he and his family went to Battersea Dogs and Cats Home in February of that year and adopted Larry Cameron, with his tenure as Chief Mouser officially starting on February 15, 2011- nepotism, it seems, knows no bounds. Needing to come up with a reason one of the Cameron surname would get such a prestigious position over so many other thousands of felines that had worked for years chasing rats and mice at various government offices (this is actually a thing) without so much as a “good job” from Mr. Cameron, according to official statements from the Prime Minister’s team, Larry Cameron was hired because of his time as a former stray which they claim gave him “a high chase-drive and hunting instinct”. They added that Larry had “a very strong predatory drive”. Despite high praise of his ninja-like killer instinct, Larry failed to make a kill until two months into his tenure, when he killed a small mouse and dropped it at the feet of one of Cameron’s secretaries. His work ethic and skill came under further scrutiny when anonymous sources revealed that Larry had been caught sleeping on the job on multiple occasions and even once took a swing at a journalist. A year into his tenure a Downing Street, a press officer urged people to remember that Larry’s job doesn’t just involve hunting mice and rats, adding that his responsibilities also include “greeting guests to the house, inspecting security defences and testing antique furniture for napping quality”. 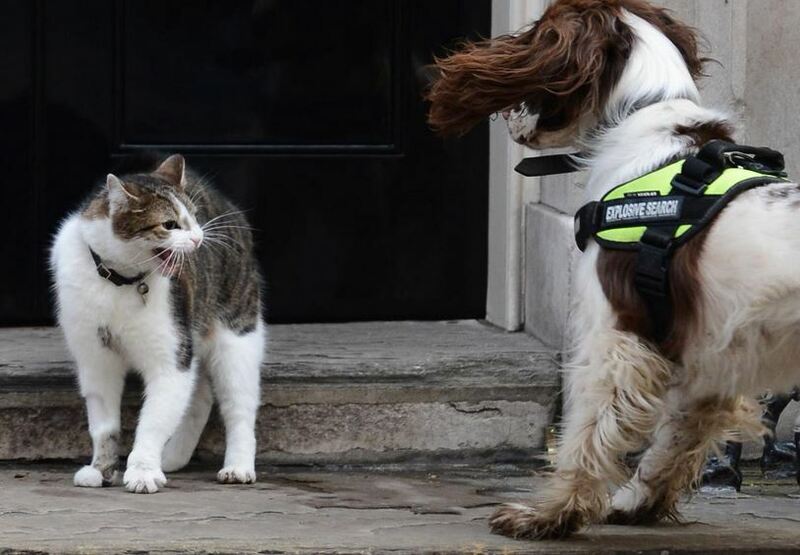 Though he’s not a particularly effective Chief Mouser, it has been noted that Larry is exceptionally talented at greeting and entertaining guests, particularly children who seem to prefer his company to that of David Cameron. That said, Larry has been noted to be slightly averse to men, particularly when he hasn’t met them, with the curious exception of United States President Barack Obama, who Larry warmed up to immediately upon their first encounter. In contrast, Larry once barred Israeli Prime Minister Benjamin Netanyahu from entering 10 Downing Street, and ultimately had to be shooed away, literally, by a police officer so the minister could enter. Larry also attends various benefits and charity events on behalf of the government in an official capacity. Despite his lacklustre work ethic and clearly being appointed to a position just because he’d scratched the backs of those in power, Larry captured the hearts of the people of Britain and has received many letters, treats and gifts from admirers over the years. However, a few years ago, Larry’s position as Chief Mouser was put in jeopardy when a new, younger female cat called Freya was brought into 10 Downing Street. Freya, who was presumed dead at just 6 months old when she went missing from her home in Notting Hill in 2009, was found alive and well over two years later and returned to her family- none other than the Chancellor of the Exchequer George Osborne and his family (occupants of 11 Downing)- in 2012. She immediately began giving Larry a run for his money. Along with being more proficient at killing mice than Larry (no doubt due to being toughened up via her life on the streets for two years), Freya was decidedly more politically inclined, preferring to spend her time in the restricted areas of 10 Downing Street where secret military missions and other classified matters are discussed. Larry, on the other hand, mostly just sleeps on David Cameron’s suits in his personal bedroom. No doubt sleeping with the boss helps Larry keep his cushy government job, despite not actually getting any results to speak of. Nevertheless, Freya’s results could not be ignored forever and, shortly after her introduction to the household in 2012, reports were issued stating that the two cats would “share” the job of Chief Mouser. This did not sit well with Larry and the cats came to blows over the decision later that year (or perhaps Freya discovered the bribes Larry purrrportedly was taking from the RPUKGBNI), forcing the police to step in and separate them. According to eyewitness accounts, Freya was the clear winner of the fight. Larry once again became the sole Chief Mouser in 2014 when Freya was hit by a car. (An accident, or a Larry/RPUKGBNI collaboration?) Although she survived, at the cost of one of her nine lives, her owner decided to send her to the countryside, claiming she wasn’t cut out for city life… despite that she’d lived on the streets for over two years at one point, leading some to speculate that the move was perhaps for her own protection. While there’s no evidence suggesting foul play on Larry’s behalf, those in the know have indicated it can’t be fully ruled out. Since then, Larry has caused yet more controversy by failing to protect 10 Downing Street from an errant heron and not being around to capture a mouse that was later caught by the aforementioned Chancellor of the Exchequer and former owner of Freya, George Osborne. This led to rumors that Osborne might usurp Larry’s position, as his pet had once done. No doubt out of fear of having his own little automobile “accident”, Osborne has never pursued the position despite his obvious skill. Curiously, despite the run-ins with the law, obvious government cover-ups, and a complete lack of results, Larry’s position- which comes with no salary, but still somehow finds him able to afford his life in the lap of luxury- continues to remain safe thanks to his popularity with the public and a host of high power friends including members of the RPUKGBNI, Obama’s pet dog, Bo, (with whom he frequently exchanges gifts), and David Cameron and his children, the latter of whom are reportedly quite fond of the animal. Although many of Larry’s predecessors had the cost of their upkeep taken care of by the taxpayer, the staff of 10 Downing Street apparently pay for Larry’s care out of their own pocket, even holding fundraising events to buy him food and toys.